TOC Student Centre and Motorsports Club co-organized the TOC Go-Kart Race 2012. The race saw 20 of our very own students battle it out for the grand prize and of course, the bragging rights. Top ten racers made it to the final after a 10 minutes best lap qualifying round. They raced to the finish line even during a heavy downpour. And the winners were Adrian Su (Champion), Ahmad Syahmi (1st Runner-up) and Teguh Arief(2nd Runner-up). Below are some photos of the event held on Sunday, 20th May 2012. Mr. Calvin Kee starts with a talk about Hap Seng Star Autohaus, a prominent dealer for Mercedenz-Benz. Mr. Waiky Foo represented TOC next, by speaking about the courses and facilities offered at TOC, and the career opportunities that await students after graduation. His exciting delivery and warm personality kept the crowd excited and interested. Between Mr. Foo and Mr Kee, the crowd had no doubt that the automotive industry offers a bright future! Our very own Mr. Waiky Foo tells about all that’s great at TOC! Two important questions remain: what’s it like working at Hap Seng Star? And where does TOC come into play? Four TOC graduates currently working at Hap Seng Star answer those questions. Among them, Fong Weng Hong, describes his experience as nothing less than enjoyable. The service advisor of 4 years is well regarded by his colleagues and tells of his daily routine with working with prestigious cars like Mercedes-Benz is something every automotive student dreams of. It’s a dream that’s become reality for these four TOC graduates. The others, See Zhan Wei, Roy Cheong and Syed Izwan who are working as a service advisor, sales executive and technical warranty executive respectively and they are just as happy working at Hap Seng Star ! TOC graduate Fong Weng Hong shares his experience working at Hap Seng Star. The attendees also had a rare, behind the scenes tour of the Hap Seng Star service centre for Mercedes-Benz cars. Being a world recognised luxury brand, customers naturally expect the best care to be given in the servicing of Mercedes-Benz cars. That quality isn’t just in the equipment and parts used, but also by having the best qualified professionals to do the job. Hence Hap Seng Star’s preference for TOC students in their hiring criteria: customers feel reassured they’re placing their beloved machines in the right hands! The dealership also boasts a service facility that impressed even TOC students. That’s a big deal, especially when students are already seeing luxury cars and sophisticated technology at TOC’s own campus on a daily basis! TOC students on a tour of the HSS Mercedes-Benz service centre. After the tour, visitors were treated to light refreshments. 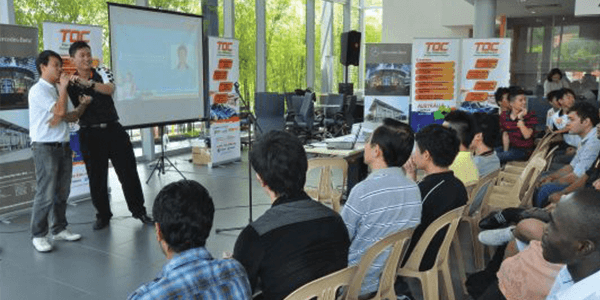 Although the program was officially over by then, TOC counsellors and Hap Seng Star staff alike found themselves busy answering questions from excited visitors about life in the automotive industry. Be it staff, parent or student, everyone found the career fair to be an eye-opening experience, and the TOC students left feeling even more motivated to carve a name for themselves!